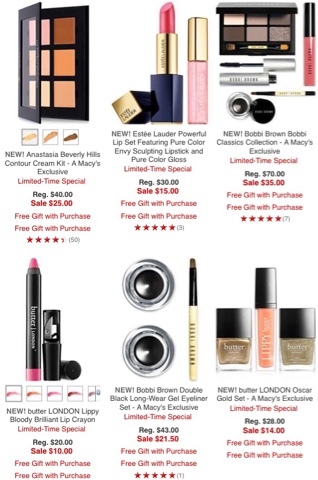 DEAL ALERT: Macy's One Day Only Beauty Deals + Free Shipping!!! First off do you see that it says FREE SHIPPING ON ALL ORDERS!!! This is the first time ever and that's a big deal. There are lots of beauty deals to be had for this special sale and the best part is it doesn't matter how small your order is shipping will be free. I'm sorry if you didn't intend to shop today but you'll thank me later when you see some of the deals Macy's has to offer. Some are over 50% off the original price. The ABH Contour Kit is a done deal. Ordered mine already. Even made a separate post because that is sure to be a very popular item. But that Bobbi Brown set is an excellent deal as well. The Clarisonic Mia and Mia 2 are both on sell in various colors and prints. It's an expensive item but if you were eyeing it now would be a great time to pick it up. Most of all the CARGO inventory is 50% off or more including all 16 of the eyeshadow singles. There are several blushes including some water resistant ones, lip glosses and more. Butter London is another brand that has lots of products being offered at 50% off or more. I also spotted a couple Estée Lauder and Clinique products as well. There's Michael Kors Nail Lacquers for 50% off too. You'll want to take a look at what's being offered or you'll be kicking yourself later for missing out on these deals. All these specials and free shipping are for TODAY ONLY until 11:59am EST! To view all of the beauty deals available today, click here. There are 12 pages of deals but you can sort out your selection on the side by choosing a category such as makeup, bath & body or skin care.